Parking for very small trailer or car. Great for college students or just extra space for holiday decorations etc. Great size for boxes or totes full of items. Holiday decorations etc. 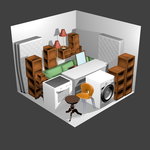 Will hold a washer and dryer set and some items on top. Great unit for small apartment or cleaning out the garage. More room for large items like corner couch sets, and large appliances. Great unit for small apartment or cleaning out the garage. 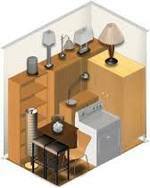 More room for large items like corner couch sets, and large appliances, or even a small car. One of our most popular sizes. Great for a small home or larger apartment. Lots of floor space for large appliances etc. This is a great size when re-locating. Typically will hold most items from a 3 or 4 bedroom home, Including furniture and appliances. Extended cab trucks or small boats. This is our largest size in Cedar. 4-5 bedroom homes will usually fit in this one. This is our largest unit. It includes 10x10 doors on both ends. Room for boats, vehicles. Lots of furniture and appliances, Or large shop items etc. 5520 cubic feet of space.